Nursing schools across the country only require one semester of public and community health as a clinical. How do you begin to squeeze community health, social determinants of health, and social justice into one semester? No wonder nursing students don’t fully comprehend their leadership potential within communities that are struggling. And no wonder once these students become registered nurses they don’t automatically ‘think outside the box’ when it comes to how nursing care can be provided and how nurses influence policy on a day to day basis. I recently took a short inter professional course entitled Preparing the Future HIV 101, a unique program at the University of Maryland Medical Center started by the Jacques Initiative, a community-based organization that links people living with HIV back to care with medical and social co-morbidities such as substance abuse, homelessness and mental health disorders. The course addresses the HIV care continuum, our national goals and what community-based organizations along with federal government are doing to address the challenges. During the course, I dialogued with a nurse in his nurse practitioner program and a second year pharmacy student. I explored with them what they are learning about social justice in nursing school. “Oh yes, we are learning about social justice” the nurse practitioner student said confidently. “They bring it up in a lot of courses.” The pharmacy student seemed to be less confident that it was a central part of her program, but very interested. When I asked if service learning or civic engagement where a part of their course both faltered. 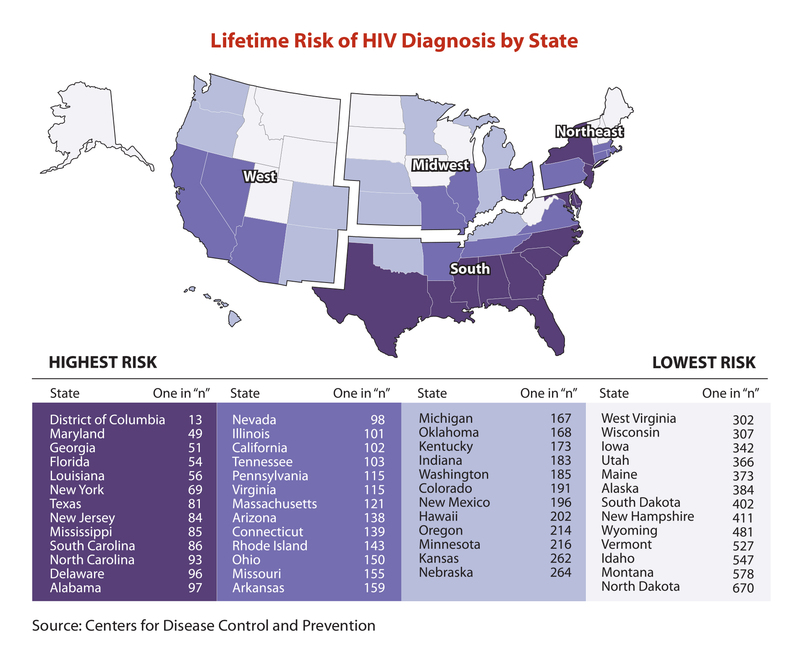 We discussed one image in particular that struck me: that of the prevalence of HIV risk by state. The map colorfully alluded to the truth that most people living with HIV are concentrated in the southern states. (Map of HIV by State). Naturally, my scientific mind began to wonder and grasp at reasons for this. Is this because these states do more testing for HIV? Do less testing for HIV? Or are these states most at risk for poverty or low socioeconomic status? The one clear pristine fact that I picked up on first perhaps as simple as an urge was: these are the states with the largest African-American populations. Once I thought this, I felt that momentary flash of anger that I usually feel when I am around others’ whose skin color bears no mark of this silent shame. It was a matter of milliseconds, but it felt like forever. These are moments that I experience all the time, everyday, on so many small and large occasions. Moments in which I feel I will burst with hurt, oddly shock, guilt and shame for my people who continue to suffer such (health) inequity in this country built on the principles of “justice for all”. In conversing with these students, I affirmed even more deeply that social justice has to leap of the page and out of the corridors of our professional institutions and directly into the communities that we serve. How can we begin to comprehend our patients/clients’ suffering or provide true healing if we don’t first understand their plight? You can be taught risk profiles by ethnicity for disease, but what you can’t be taught in a school is the day to day struggles that African-Americans, or other such ethnic groups, face to be functioning members of society. Strengths like community resiliency and adaptation have to be witnessed up close and personal. For most of us, stepping outside of our bubble has to start with walking down the same streets of our clients, observing the built environment that they live in, or visiting a faith-based organization. In short, civic engagement and thereby policy change begins with the small almost seemingly insignificant acts of tolerance, understanding and awareness. These small acts are the first rungs in the ladder of climbing toward standing in solidarity against hatred and indifference. Does white privilege mean anything in patient care?